NOTE: The "Dark Horses" music video is being shot as we speak. "Dark Horses" is beginning to make significant inroads on the Billboard Charts. - This week, it jumps up three spots to reach No. 28 on Alternative Songs/Modern Rock. - It also hits the Rock Songs chart at No. 50 this week. - But most significantly, it's No. 13 on the Billboard Hot 100 Bubbling Under songs. What this means is, it is just outside of the Billboard Hot 100 charts, the holy grail of singles charts, which combines radio airplay across the entire nation, sales data from iTunes/Amazon/etc., and streaming activity from online music sources. 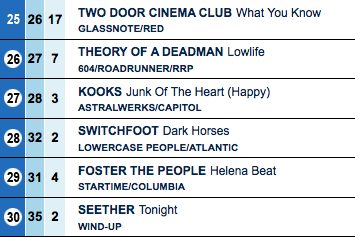 If we can push "Dark Horses" into the Hot 100, it will be the first time that a Switchfoot song made that chart since "Stars" back in 2005. This is HUGE, folks.